• You can send us a return request within 30 days from the date of delivery. After that date, we will no longer accept your request. • Products must be returned in the same condition as they were received with all tags and labels still attached and in the original packaging. • Purchased products cannot be exchanged. If you wish to change your product, you will have to return it and make a new online order. We will credit the money of the first order as soon as possible. • Post the parcel WITHIN 30 DAYS from the online form filling. No problem: go to the ‘Returns’ sections of the website, which is located at the bottom of each page, and follow the instructions provided there. If you would rather contact Customer Care, you will need the order number and the details of the item(s) you wish to return. You will be assisted throughout the process. If you wish to return a gift, you should contact Customer Care directly. • When returning a product, we offer a free return service. • Once the returned product has reached our warehouse, it will not be send back to you again. • If the returned product is accepted, you will receive a confirmation email and your return request will be processed promptly. • The amount due will be credited to the same account used for the purchase. • Should there be problems with the returned product, you will be contacted by our Costumer Care for further clarification. If you wish to return one or more items under warranty, please contact Customer Service on support_int@dynafit.com or fill in the online form that can be found under the ‘Contact Us’. We will assist you throughout the process. 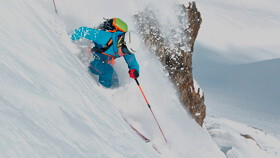 For additional information, please check the ‘Terms and Conditions’ section at www.dynafit.com.